Stanford received $951.1 million in philanthropic gifts between September 2015 and August 2016, the second-highest fundraising sum of any university last year. Over 80,000 donors contributed. Funds raised include $103.3 million for financial aid, $60.1 million to attract and support faculty, $355.7 million for research and programs, $73.9 million for buildings and facilities, $32.4 million for Stanford Health Care and $55.9 million for Lucile Packard Children’s Hospital Stanford. Donors raised nearly $67 million through annual contributions alone.The fundraising total also includes nearly $235 million in new gifts that were added to the endowment. “Their generosity allows Stanford to advance its goals of fostering education, research and creativity for the benefit of humanity,” he said. Other gifts to the University were used to build two new dormitories, Meier Hall and Norcliffe Hall, and to support various service and scholarship programs for undergraduate and graduate students. For the fiscal year 2014-15, the University reported $801.6 million in cash gifts in addition to $622.3 million in donations of art and $201.1 million for Stanford’s hospitals. According to a study by the Council for Aid to Education, the growth rate of charitable giving to colleges and universities nationwide has slowed from the 2014-2015 fiscal year. The growth rate dipped to 1.7 percent from 7.6 percent the year prior. This drop may be due to poorer stock market performance. Studies show that alumni and individual giving also spiked in the 2014-2015 fiscal year, making this year’s drop less significant than it might seem. Furthermore, while college and universities’ numbers of individual contributions have dropped, foundations and corporations have increased their donations to counterbalance this decline. The Council for Aid to Education survey showed that the top 20 fundraising institutions of 2016 received more than 27 percent of the $41 billion donated to colleges and universities nationwide. Nevertheless, the number of large gifts is decreasing. Stanford was one of only two universities to receive a gift over $100 million this fiscal year. 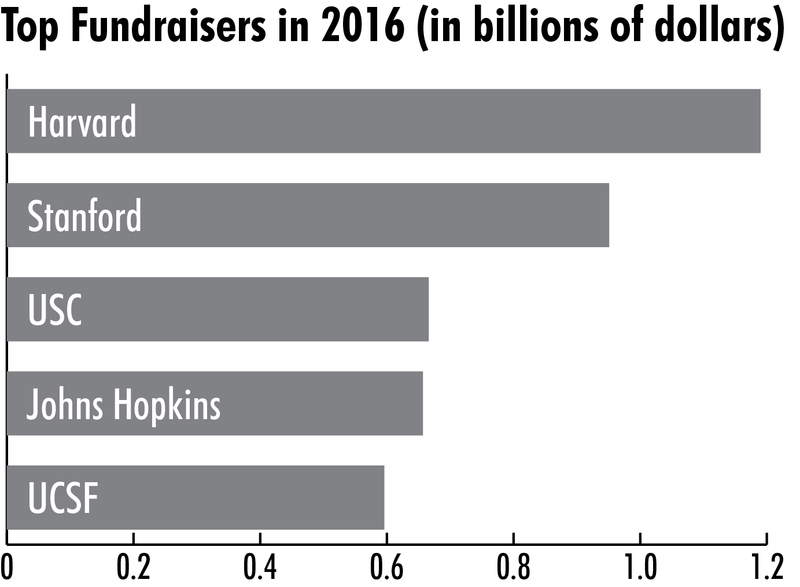 Some uncertainty remains about the future of charitable donations. The council warned that possible policies discussed by Republicans in Washington, including “lowering top marginal tax rates [and] limited charitable contribution deductions,” might lower the rate of charitable giving over time. However, Martin Shell, vice president for development at Stanford, expressed positivity about the generosity of Stanford’s donors. Contact Veronica Kim at vkim70 ‘at’ stanford.edu. A previous version of this article stated that Stanford’s endowment payout contributed $235 million to the fundraising total, when in fact $235 million of the fundraising total was added to the endowment. The article also originally omitted gifts of art and gifts to Stanford’s hospitals in the fundraising total for the fiscal year 2014-15. The Daily regrets these errors.